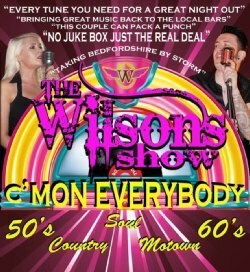 NOW KNOWN AS SIMPLY - THE WILSONS SHOW are Karen and Paul Wilson - a vocal duo from Luton, whose show pays tribute to the legends of 50's & 60's and Country music. Karen Wilson, formerly from the band 'Say No More', has been performing for over 12 years as a vocalist and even toured Europe with her previous band. Paul Wilson (AKA 'Wilson'), formerly one of the top 5 Elvis impersonators in the country, has been performing for over 8 years and was ranked 3rd best 'Elvis' in the UK in 2009! While taking a break from Elvis, Paul formed the band called 'Wilson & The Vipers' in realisation of a need to do more than impersonate Elvis. Then, after a few more years performing Elvis shows, Paul decided to call it a day and retire as an impersonator. Karen & Paul met in 2010 and the two became a couple which led them to create The Wilsons Show and by taking Karen's country roots and blending them with Paul's love for rock 'n' roll, the duo was born. The show first aired in March 2012 and has since received great reviews from the public and landlords. The show now comprises 50's & 60's Rock 'n' Roll, Country, Soul, Motown & Irish music.